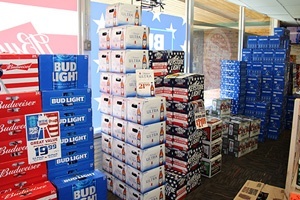 At Brewski Barn & Wine Cellar, we have created one of the most unique experiences you will ever have while shopping for beer, wine, & spirits in Kansas. 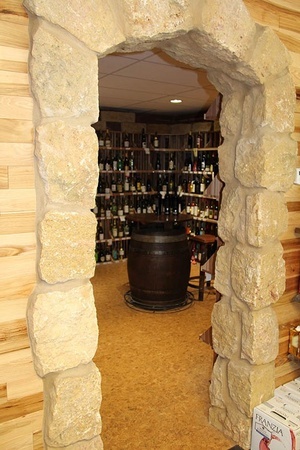 How many times have you shopped for a bottle of wine and walked through an entrance made of real tree trunks, turned the corner and entered a rustic stone archway that leads to an incredible atmosphere in a wine cellar with custom redwood wine racks, dimmable LED lighting, a floor made of real wine corks, a real wine barrel tasting table, and over 500 carefully-selected wine varieties….meticulously organized by grape variety with hand-engraved limestone boulders….and the option of chilling any bottle in our store to 32 degrees in 5-7 minutes with our free chilling service. Sound unique? Well, that’s how we roll at The Barn. 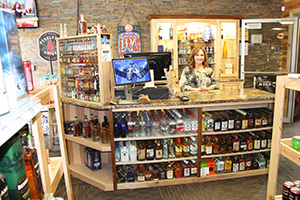 We want our customers to have a first-class experience like they’ve never had in any other liquor store. 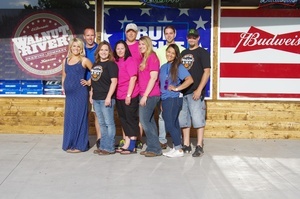 WE ARE MUCH MORE THAN A “LIQUOR STORE”. It starts with our incredible staff. They will greet you with a smile, offer expert advice if needed, offer suggestions to help you decide, point you in the right direction if you already know what you want, and leave you feeling appreciated. Need assistance carrying your purchase to your vehicle? No problem! If we feel like you need assistance, odds are good that we are already following closely behind you with your product in our hands, holding the door for you, as we carry it to your car and place it in your back seat, telling you to enjoy the rest of your day. That’s what we do. That’s who we are. The clean, rustic atmosphere and decor. It’s like no other. An outside structure made of Ponderosa Pine logs, rustic stone accents with an arched entryway, and beautiful front planters. An interior with a ledgestone backdrop, solid hickory walls, custom granite countertops, brand new coolers and equipment, a cleanliness that’s hard to find, and seasonal décor that makes it more fun to shop. It continues with an outstanding selection of products, constantly-updated with new seasonal selections. 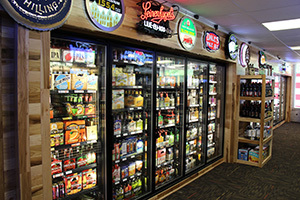 We have one of the most extensive craft beer selections in the State, which happens to be a passion of ours. Our wine selection is hard to beat, and everything is carefully organized so you can easily find your favorite variety, your preferred price range, and your final choice for the evening. 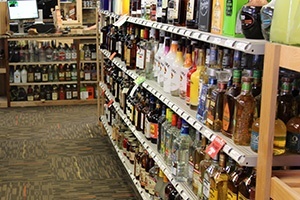 Our liquor variety is also outstanding, with a price range for any customer and budget. Speaking of price, we strive to keep all of our pricing competitive for our customers. 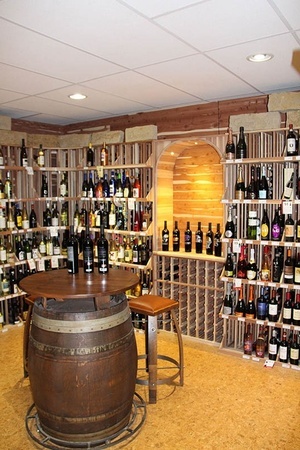 Pair that with a top-notch unique experience, and it’s hard to beat shopping at Brewski Barn & Wine Cellar. Ice. Cold. Beer. Enough said. When you purchase your beer at our store, plan on using a koozie to prevent frost bite! We strive to keep all of our beer just above freezing, just the way it should be! We would like to sincerely thank all of our customers that have supported us since we became Brewski Barn & Wine Cellar in August 2014. It has been quite the transformation since we started our renovation project, and you all have been right by our side the entire way…even when you had to step over a huge mess, walk around construction tools, follow directional arrows to different doors, and listen to the hammers swing while you shop! WE WILL NOT STOP IMPROVING OUR STORE. Even though our remodel is now complete, we have many more ideas and ambitions. Your shopping experience will only get better and better as time goes on. 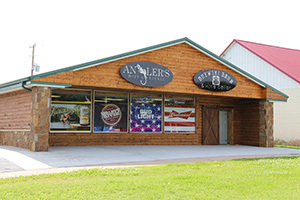 We are very excited to offer this one-of-a-kind retail store in our home town of El Dorado. Give us a call at 316-321-3443 today! If you have a restaurant or bar, call on us for outstanding service, free weekly deliveries, outstanding prices, and suggestions to make you more profitable. Serving all of Butler County, Kansas. 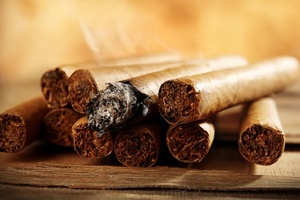 Located in our humidor next-door, you will find an outstanding variety for the cigar aficionado, the weekend golfer, and everything in between. Stored at a perfect 70% humidity with our state-of-the-art system. Need help planning your big day? Our experienced staff can offer suggestions to make your wedding, party, charitable auction, or any other event a huge success. We’ll give you a special discount too! !